Unity is a fun, safe playground structure providing an outlet for children 5-12 years old to engage in unstructured independent or group play. A series of 10 various climbing, sliding and crawling events are found throughout the 6" to 54" multi-level platforms, which helps foster creativity, learning and socialization. 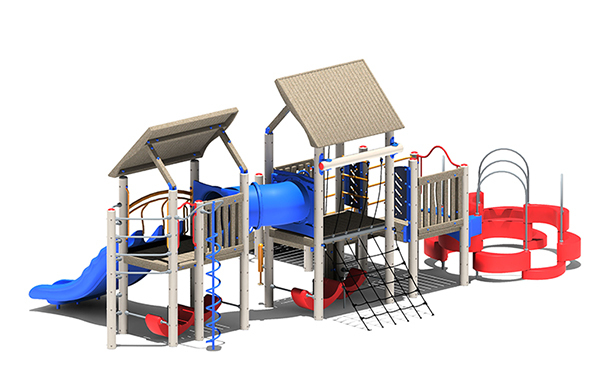 Use Zone: 44'6" x 30'0"
Developed with strong, eco-friendly materials, the Unity Playground Structure features large 6"O.D. columns and is available in conditioned Norwegian Pine or recycled powder-coated metal with 100% recycled HDPE plastic materials. The Cargo Net, Curly Climber, Fire Fighters Tower and Play Shell Traverse create a fun, challenging opportunity to learn a new skill, bond with another and improve muscular endurance. The main entry platform allows quick, easy access to the Big Tube Crawl Tunnel which leads to the favorite Triple Slide. Two angled roof panels help cool the structure and the ground level Play Shell Seats provide a second area of refuge to cool off, rest and relax.